As brands try to target Gen Z and their financial influence, roughly estimated at $29 to $143 billion in direct spending by 2020, there are a few things to keep in mind. This new generation is hard working, pragmatic, and believe they can change the world. They are more socially conscious than those before them and rather than looking towards older role models, they look to one another. So, what does this mean for brands? Gen Z is calling for transparency. They are looking to others whom they can trust, and they are able to filter through the noise of marketing and online media faster than millennials. Basically, they can call you out on your discrepancies and they won’t hesitate to do so. For a brand to become relevant to this generation, they must become a voice that can be trusted. In a world of technology, a Gen Z does not have to have a face to face relationship with someone to feel connected to them. They aren’t looking to older role models as generations before them have; instead, they are looking to their peers. For brands this means the most influential voices in reaching Gen Z is Gen Z influencers. 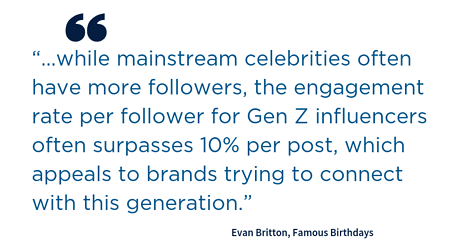 In a Forbes interview Evan Britton, founder of Famous Birthdays, stated, “…while mainstream celebrities often have more followers, the engagement rate per follower for Gen Z influencers often surpasses 10% per post, which appeals to brands trying to connect with this generation.” Engagement is where the magic happens. 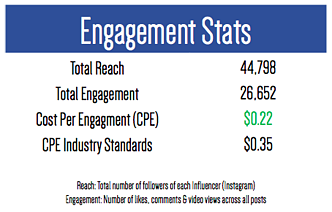 Interaction with the influencer is far more valuable than a simple Facebook like. Interaction means that connection is happening and, hopefully, trust is being built between the brand and the influencer’s audience. Gen Zs trust Gen Z influencers more than they trust anyone else. As a brand establishes itself as a relevant trusted voice, using a Gen Z influencer will provide the audience and the platform. Are You Ready For The Rise of Gen Z? Gen Z has more options in the digital world then ever before, but like Millennials, well all of us, they still only have 24 hours in a day. How they consume online marketing has significantly changed. They are able to filter out the noise and irrelevant information at higher speeds than the rest of us. They want their content fast and demand that brands capture their attention and not waste their time. 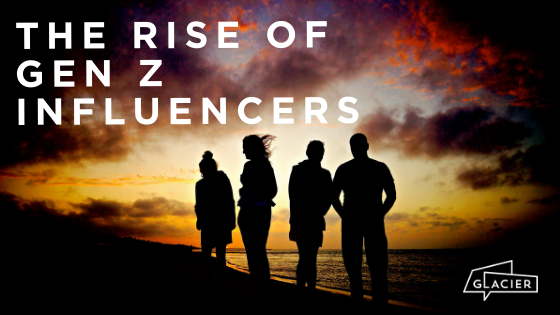 One-way Gen Zs filter out the noise is by turning to those they trust, their peers and established influencers. This generation does not appreciate sales copy. Instead, they value genuine engagement. Gen Z wants brands that provide value, personalization, interactivity, and are focused on making the world a better place. Gen Z is listening to their peers and brands need to take notice. Here’s one example of how 11 Gen Z influencers created a 330% ROI for one event. If your goal is to gain the attention and trust of the Gen Z crowd, using their peers to do so is a smart move. It is really the only move!